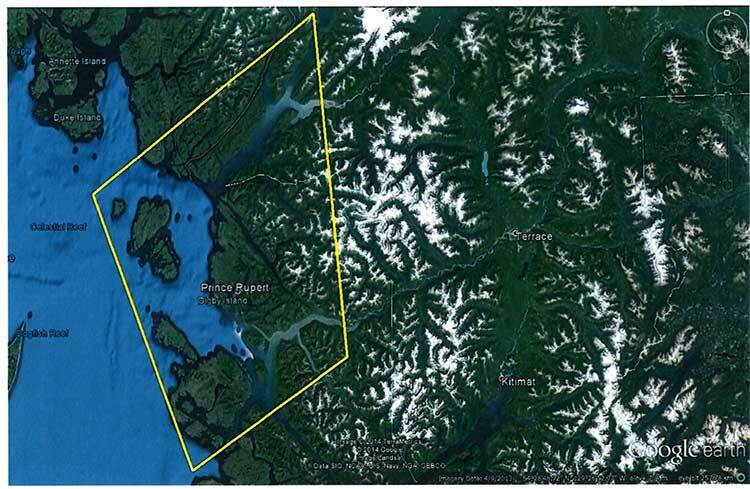 The province of British Columbia has posted a request for bids for an extensive air shed study for Prince Rupert, a study that has much wider scope that the controversial Kitimat air shed study. The maximum cost for the study is set at $500,000. a study of potential impacts to the environment and human health of air emissions from a range of existing and proposed industrial facilities in the Prince Rupert airshed, further referred to as Prince Rupert Airshed Study (PRAS) in North West British Columbia. – vegetation and human health impact mechanisms related to direct exposure. Water and soil impact predictions will be based on modelled estimates of critical loads for both media, given existing and predicted conditions in the airshed. Vegetation and human health impact predictions will be based on known thresholds of effects, given modelled existing and predicted conditions (contaminant concentrations) in the airshed. Although the documents say that the Prince Rupert study will be based on the same parameters at the Kitimat air shed study, the Kitimat study only looked at sulphur dioxide and nitrogen dioxide, and did not include particulate matter. Environmental groups also criticized the Kitimat air shed study for not including green house gases. The proposed Prince Rupert study also does not include green house gases. A draft report is due by March 15, for review by the province and affected First Nations and subject to peer review. The District of Kitimat was not asked for comment on the study on that air shed study, even though scholars as far away as Finland were asked to review it. It appears that Prince Rupert itself is also excluded from a chance to review the study. The final report is due on May 15. The province has issued a permit to Rio Tinto Alcan to increase sulphur dioxide emissions from the Kitimat Modernization Project. The Environmental Appeal Board will hold hearings in January 2015. Elisabeth Stannus and Emily Toews, from Kitimat, have appealed against decision to allow RTA to increase sulphur dioxide emissions. LNG Canada, the project led by Shell Canada Energy, has passed the first step in the environmental review process for the liquified natural gas plant and terminal. LNG Canada said Tuesday that the British Columbia Environmental Assessment Office has approved LNG Canada’s Application Information Requirements (AIR) for the proposed project. The company says the AIR outlines the studies, methods, and information that will be required in LNG Canada’s Application for an Environmental Assessment Certificate. The LNG Canada AIR was developed in consideration of comments submitted by the public, First Nations and regulators during a 30-day public comment period held in November/December 2013, including a public meeting at the Kitimat Rod & Gun, where documents were distributed and employees answered questions from politicians and the public. LNG Canada says it will now continue to gather information and complete studies in support of developing our Environmental Assessment Application. The company intends submit to the Environmental Assessment Application to the the B.C. EAO later this year. LNG Canada will hold its next public meeting, an “LNG Demonstration and Presentation” on March 6, 2014 at the Mount Elizabeth Theatre starting at 6 p.m. The company says the event is to “to share information and answer questions about liquefied natural gas (LNG).” Starting at 7 pm there will be a a live demonstration using LNG to explain the science behind liquefaction and the properties of LNG. For more information about the project’s EA process, www.eao.gov.bc.ca and look for our project under the “Proposed EAs” sections. The other partners in the LNG Canada project are Diamond LNG Canada, an (“affiliate” of Mitsubishi), Korea Gas Corporation and Phoenix Energy (an “affiliate” of PetroChina). LNG Canada says it wants to be “first out of the gate” in the competitive race to send BC’s liquified natural gas to Asian markets. The LNG Canada Export Project is a partnership of Shell,Canada Energy, Diamond LNG Canada, an (“affiliate” of Mitsubishi), Korea Gas Corporation and Phoenix Energy (an “affiliate” of PetroChina) filed a draft application for an Environmental Assessment Certificate with the BC Environmental Assessment Office and Canadian Environmental Assessment Agency on November 8. The 30-day public comment period on the draft Application Information Requirements started on November 13, 2013 and end on December 13, 2013. The extensive documentation can be downloaded in PDF format from the BCEAO site. The documents can also be viewed at the Kitimat and Terrace Public Libraries and the LNG Canada office in Kitimat at the old Methanex site. “What we want to be able to do is actually to provide information in a way that we can provide a lot of conversation with the community, so we can really have a dialogue, to give them a place where they know than go to get answers. We do believe that we can be the best project in British Columbia, the only way we can do that is if we have the support of the community,” LNG Canada’s Susannah Pierce told reporters. Federal, provincial and municipal governments or agencies, First Nations and the general public have the ability to comment on the proposal. An aerial photo map included in the application shows the footprint of the proposed LNG Canada operation. Although the LNG Canada project is based at the old Methanex plant, the map shows that the LNG plant will take up a much larger area than the original. 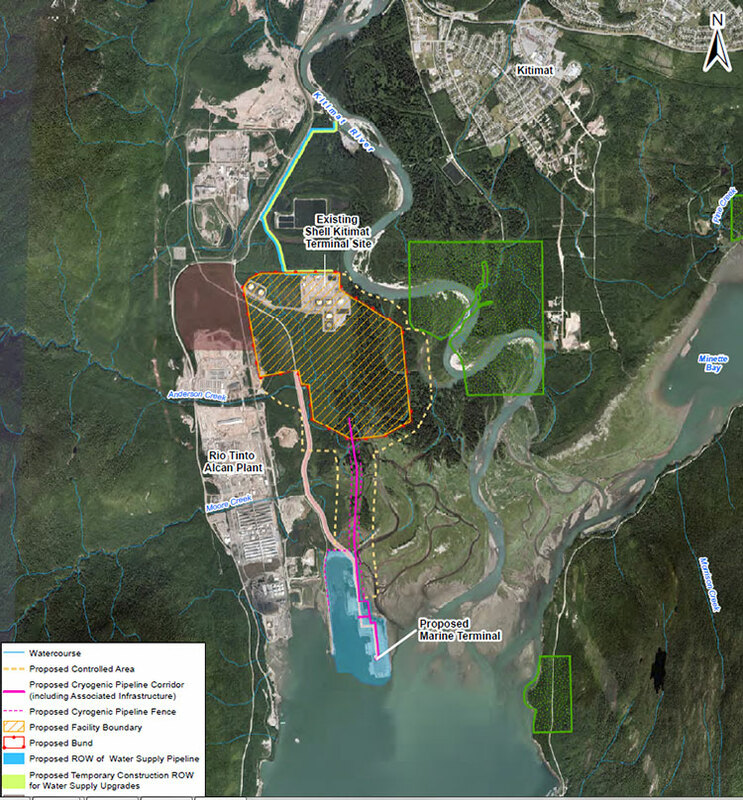 The old Methanex access road would be widened parallel to the Rio Tinto Alcan smelter and a Cyrogenic Pipeline would cross the Kitimat River estuary to the marine terminal. The scope of the project includes one possibly controversial item: “Onsite power generation,” where natural gas would be used to power the cooling equipment to turn the gas into LNG. The assessment will also look the natural gas receiving and production facility; “a marine terminal able to accomodate two LNG carriers each with capacity up to 265,000 cubic metres (approximately 122,000 DWT) and a materials offloading area; supporting infrastructure and the construction facilities. The environmental assessment will examine air quality, green house gas management, the acoustic environment (the noise created by the project), soil, vegetation, wildlife, freshwater, esturine fish and habitat, marine resources including fish and fish habitat and marine mammals, water and ground water quality. The economic and social assessment includes infrastructure, land use, “visual quality,” odour, marine transportation and use, community health and well being, archaeological heritage and human health. The assessment process will also “assess potential cumulative economic, health, social and heritage effects from the Project…interacting cumulatively with similar effects of past, present and future projects activities. The current table of projects to be considered for cumulative effects include the Rio Tinto Alcan Aluminum Smelter and Modernization Project, the Kitimat LNG and Douglas LNG terminals, the possible Enbridge Northern Gateway porject, the new use for the old Methanex and Cenovus operations, the operations at the Sand Hill, the former Moon Bay and current MK Bay Marinas. 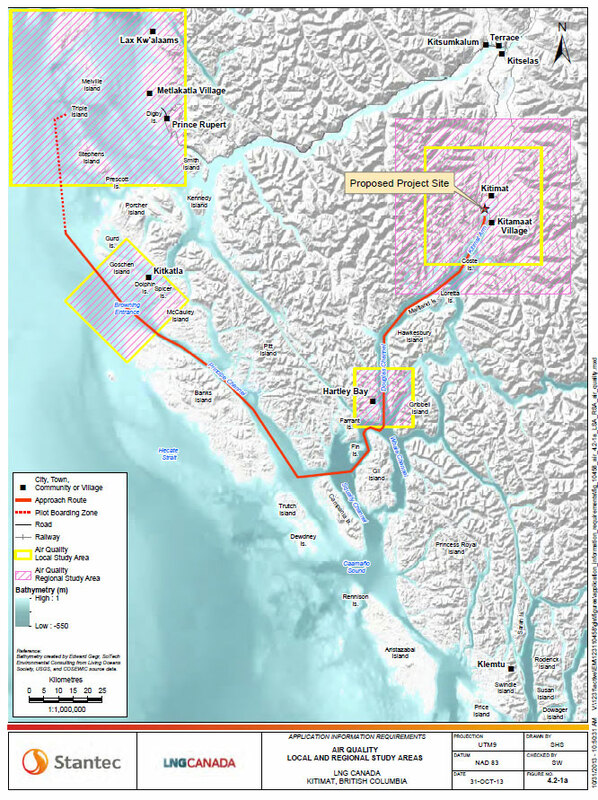 Projects further away include LNG and other projects and associated pipelines at Prince Rupert, including expansion of the current ports and the redevelopment of Watson Island. Cruise ship and BC ferry operations will be only considered where they impact the shipping routes. Any forestry operations will also only be considered where they impact the project. 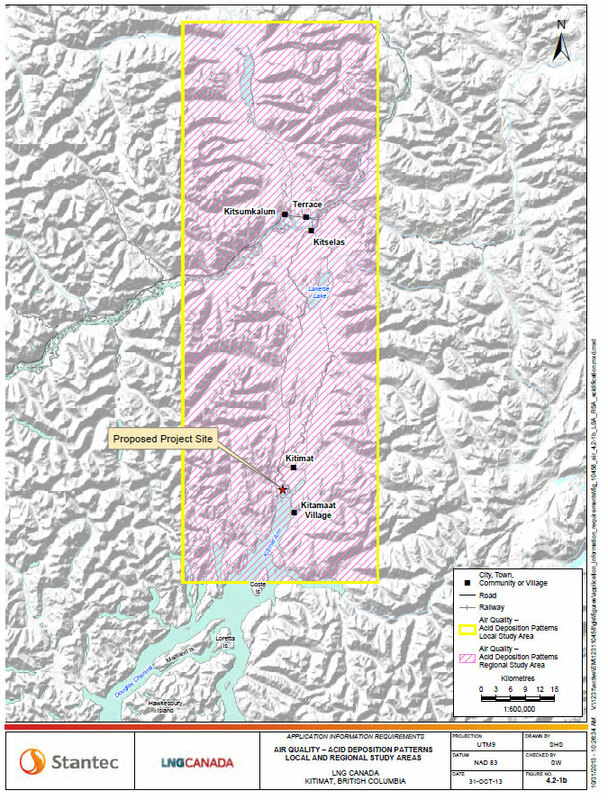 Two of the maps filed by the LNG Canada project with provincial and federal environmental assessment agencies look at the air quality problems from the project, including the controversial prospect of cumulative problems from multiple industrial projects in the Kitimat Valley, one of them the RTA Kitimat Modernization Project which will increase sulphur dioxide emissions while decreasing some other emissions. One map covers what is being called the airshed, in the case of LNG Canada, air quality will be assessed with the LNG facility at its centre. A second map covers the tanker route, and as well as a 40 km square grid around the plant that will also assess Hartley Bay, Kitkatla and Metalkatia which may be impacted by vessel emissions. The possible cumulative effect on the air quality in the Kitimat valley and surrounding areas has prompted the BC government to commission its own study of the Kitimat airshed. The Kitimat Airshed Impact Assessment Project will look at the cumulative effects of existing and proposed industrial air emissions in the airshed. These include emissions from: an existing aluminium smelter, three proposed LNG terminals, a proposed oil refinery, a crude-oil export facility, and gas-turbine-powered electrical generation facilities. The study will focus on sulphur dioxide and nitrogen dioxide emissions from these facilities. The study will assess the impact of emissions through a number of scenarios, including their potential effects on water and soil, as well as on vegetation and human health from direct exposure. An airshed is generally described as an area where the movement of air (and, therefore, air pollutants) can be hindered by local geographical features such as mountains, and by weather conditions. The most obvious example in British Columbia is a mountain valley. Since air pollution knows no political boundaries, airshed activities may be focused on a single community or on a number of neighbouring communities faced with similar air quality problems and requiring similar action. The LNG Canada assessment will look at two potential adverse effects, first a change in ambient air quality in the Kitimat airshed or along the marine access route and second any change in acidic deposition pattern in the Kitimat Valley. The first study will look specifically at estimated levels of “criteria air contaminets” including sulphur dioxide, Nitrogen oxides, carbon monoxide, atmospheric particulate matter and hydrogen sulphide. The particulate matter study will use the international standard of 2.5 micrometres. The assessment will also study possible cumulative effects on air quality of multiple projects and those projects over time. Buried deep in the LNG Canada environmental assessment application, a reader will find a key difference in attitude with at least one of the group of companies planning liquified natural gas development in the northwest and Enbridge Northern Gateway. It’s an earthshaking difference, since it’s all about earthquakes. The documents filed by LNG Canada with the BC Environmental Assessment Office and the Canadian Environmental Assessment Agency acknowledge that there is a possibility of an earthquake (a one in 2,475 year event) at the LNG terminal site. Northwestern British Columbia was shaken by two major earthquakes in the months before the Joint Review Panel concluded its hearings in Terrace. Both were far from Kitimat, but felt across the District. On October 27, 2012, there was a magnitude 7.8 earthquake on the Queen Charlotte Fault off Haida Gwaii. 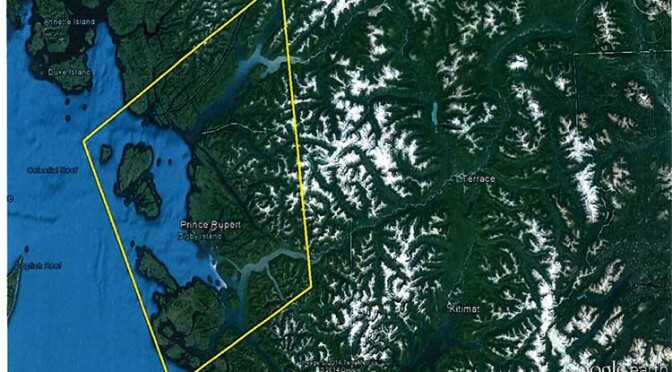 That quake triggered a tsunami warning, although the actual tsunami was generally limited to the coast of Haida Gwaii. Both landline and mobile phone service in Kitimat was briefly disrupted by both the quake and overloads on the system. Kitimat was also shaken by the 7.5 magnitude earthquake centered at Craig, Alaska a few weeks later on January 9, 2013. With the exception of one vague reference in its final argument documents presented to the Joint Review Panel, Enbridge has stubbornly refused to consider any seismic risk to the region. That was the company’s policy long before the October. 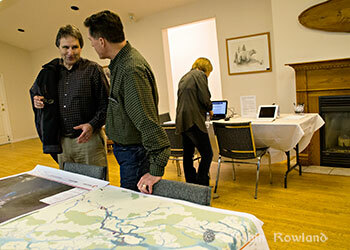 27, 2012 Haida Gwaii earthquake and was Enbridge policy after October 27, 2012. In a public meeting in Kitimat on September 20, 2011, more than a year before the Haida Gwaii earthquake, John Carruthers, Northern Gateway president, insisted to skeptical questioners at a community forum at Mount Elizabeth Theatre that there was no earthquake danger to the proposed Northern Gateway pipeline and bitumen terminal in Kitimat. One of the questioners, Danny Nunes, of Kitimat, asked could the pipes withstand an earthquake? Carruthers repeated that Kitimat was not in an earthquake zone, that the fault was off Haida Gwaii and so would not affect Kitimat. After the September, 2011 meeting, I asked Carruthers if Enbridge knew about the March 27,1964 “Good Friday” magnitude 9.2 Alaska earthquake that, because of its high magnitude, had caused major shaking in Kitimat. That earthquake destroyed much of Anchorage and triggered tsunamis that caused damage and death across Alaska and in parts of British Columbia, Oregon and California. Carruthers promised to get back to me and never did. That brought a gasp from spectators in the room, or at least those who had felt the October and January earthquakes. “Now, that’s interesting because isn’t that the first time — the first admission by the Proponent in a little over 10,000 pages of documents that the area they intend to build their project is in a seismically-active area? “Haven’t they been telling us all along to this point that the only seismic concerns would be from the distant Queen Charlotte fault off of Haida Gwaii? “Well, really? Is that a truthful statement, considering Natural Resources Canada has only submitted a preliminary report concerning a 50-kilometre fault line and massive submarine landslides they accidentally discovered last year in Douglas Channel while doing a modern survey of the Channel for navigation hazards. “How can the Proponent claim to have adequately addressed seismic forces in their design of this Project when they don’t know what those forces are or for what duration they may be subjected to those forces. “Has there ever been a paleoseismological study in the Project area to establish past earthquake or tsunami history? In his final rebuttal on June 24, Neufeld did not address the contradictions that Minchin had pointed out. Compare Enbridge’s attitude to the view of LNG Canada, which at very least, appears willing to consider that major events could have adverse consequences on the terminal and liquifaction facilities. The first one is a bit puzzling to Kitimat residents “A 1 in 100 year 24 hour rain event,” after all the town often gets rain for 24 hours straight or more fairly often. The second, 1 in 200 year flood of the Kitimat River. Flooding has always been a concern and will be even more so, because as the pipelines come into town, whether natural gas or bitumen, those pipelines will be close to the river bank. The 1 in 2,475 year seismic event. That figure is probably correct for a local event given the geology of the Kitimat Valley—unless, of course, the fault line discovered by the Geological Survey of Canada on Hawksbury Island proves to be a potential danger. Change in flow of the Kitimat River. Although the hydrocarbon industry as a whole is reluctant to acknowledge climate change, it appears that on a practical level, the LNG Canada partners, if they are about to invest billions of dollars in a natural gas liquifaction plant and marine terminal, will certainly take steps to protect that specific investment from the effects of climate change. On the other hand, the National Energy Board, as matter of policy and the Northern Gateway Joint Review Panel, both still stubbornly refuse to even consider any effects of climate change, even possible effects locally on a specific project application. The Joint Review Panel decision on the Northern Gateway is expected sometime in the next three weeks. While most reports seem to indicate that the decision will be released after Christmas before the Dec. 30 deadline, there has been recent media speculation that the decision could be released next week. In the meantime, Enbridge has pulled out all stops in a public relations campaign to build support for the Northern Gateway. While a recent poll indicates that advertising campaign may be having some success in the Lower Mainland, the same poll showed that 65 per cent of northern BC residents oppose or strongly oppose the Northern Gateway. The problem for Enbridge is that the new public relations campaign is repeating the blunders that began when they first proposed Northern Gateway in 2005. 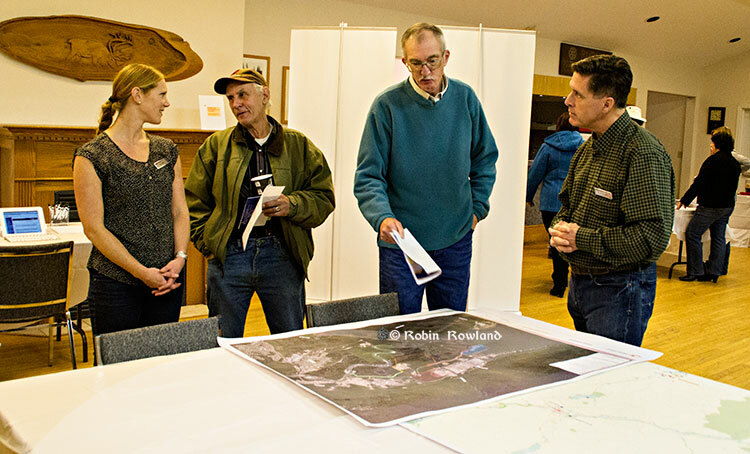 There have been meetings across the northwest, but those meetings have been invitation only affairs at chambers of commerce and community advisory boards, with possible opponents or skeptics and media perceived as critical of Enbridge not invited. So Enbridge still wants to control the message and will only talk to friendly gatherings. Then there are the television spots featuring Janet Holder, the Enbridge vice president in charge of Northern Gateway, supposedly showing her commitment to wilderness. Those commercials would have had more credibility if the agency had produced the ads with actual video of Holder walking through the bush, rather than shooting the spots in front of a green screen in a studio, with pristine wilderness stock video in the background, and Holder acting as if she was a model for an adventure clothing company rather than vice president of a pipeline company. Right-wing business columnists in Toronto and the countless Albertans fume at the so-called “hypocrisy” of British Columbians who support LNG and oppose bitumen. Of course, those critics didn’t feel the earth move under their feet. The critics don’t see the difference between natural gas and bitumen, differences very clear to the people of British Columbia. It’s more than the fact, that so far, the LNG projects have been relatively open and willing to talk to potential adversaries, as Chevron has done on the controversial Clio Bay project; more than the fact that if even a fraction of the LNG projects go ahead, the money coming into northwestern BC means that the handful of permanent jobs promised by Enbridge will be literally a drop in a bucket of warm bitumen. Although there are many other environmental issues on the Northern Gateway project, the fact the potential for earthquakes in Kitimat is brushed off by Enbridge while LNG Canada is at least willing to consider the problem, sums it all up.